GERMANY: Foundations specialist EEW SPC has been awarded the contract to supply 116 monopiles to Dong Energy's 1.2GW Hornsea Project One site, off England's east coast. A total of 91,800 tonnes of steel will be used, with the manufacturing taking place between March 2017 and April 2018. The monopiles will support Siemen's 7MW turbines, expected online in 2019. Each monopile will have an 8.1-metre diameter. "With the completion of the monopiles for Hornsea Project [One] we will have both directly and indirectly produced over 600 foundations for Dong Energy," said EEW managing director Heiko Mutzelburg. EEW is a long-time supplier to Dong Energy's offshore wind projects, having supplied to most of its major sites. 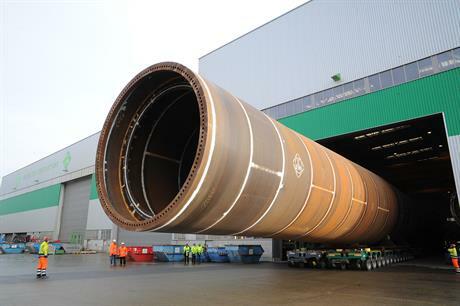 In September 2015, EEW was contracted to supply foundations to Dong's 660MW Walney Extension sites, with some monopiles being made in the UK through Offshore Structures Britain (OSB), EEW's UK-based joint venture with Bladt Industries. At the start of November, Dong handed the inter-array cabling contract to UK-based firm JDR Cables.